I … have witnessed … what has become over the years the annual commercialization of Christmas. I am saddened to see Christmas becoming less and less about Christ and more and more about marketing and sales, parties and presents. And yet, Christmas is what we make of it. Despite all the distractions, we can see to it that Christ is at the center of our celebration. I love Christmas. There is a spirit at Christmastime. It descends upon the world—not just to members of the Church but across the world—a testimony and a witness that Jesus is the Christ. The magic and wonder of Christmas are not found in the lights, trees, ornaments, decorations or brightly wrapped gifts, they are found in the birth of the babe of Bethlehem and in the spirit that He brings to the world. Little children easily find the magic of the season because they exhibit the attributes of Christ. When we see things through their eyes, we can “become as little children” and find the magic and wonder of the season, too. As parents know, little children are, by their nature, without guile. They speak the thoughts of their minds without reservation or hesitance as we have learned as parents when they embarrass us at times. They do not deceive. They set an example of being without guile. I learn much from my children about this. Coming home recently from a day at the ski hill, we passed a car that was stuck in a snowdrift on the side of the road. As we drove by, my kids said, “Mom! Why aren’t you stopping to help that guy?” Their first thought was to help out someone in need. I was thinking in more practical terms, and I didn’t know if I had a tow rope with me. Children are inherently without guile or hypocrisy. They don’t look for ulterior motives in others, and they don’t have their own. 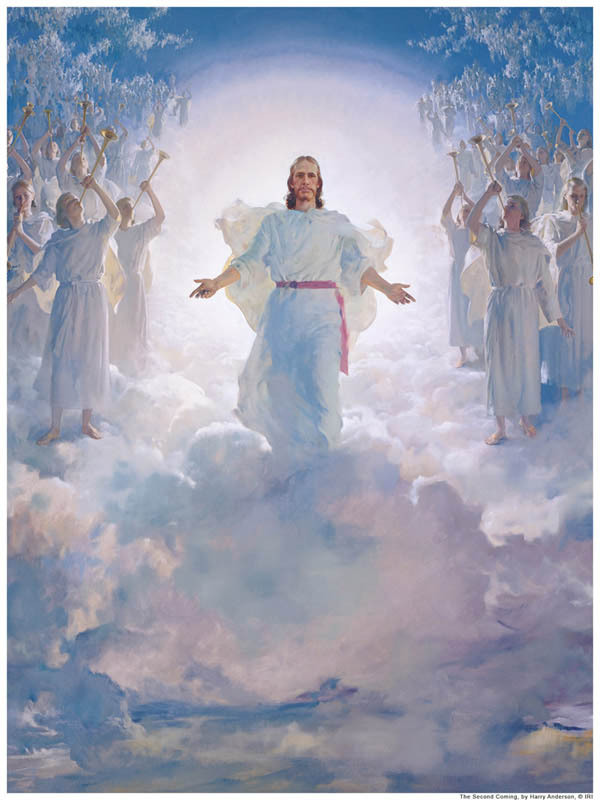 This is just as the Savior is, and this is how the Savior would have us be. When we view Christmas through this lens, we can see the everyday miracles of those who do stop to help just because someone is in need. We see the goodness and beauty around us, and we can feel the spirit of the season. … They had to descend from human company to a stable, a grotto full of animals, there to bring forth the Son of God. I have wondered if this young woman, something of a child herself, here bearing her first baby, might have wished her mother, or an aunt, or her sister, or a friend, to be near her through the labor. Surely the birth of such a son as this should command the aid and attention of every midwife in Judea! … But it was not to be so. With only Joseph’s inexperienced assistance, [Mary] herself brought forth her firstborn son, wrapped him in the little clothes she had knowingly brought on her journey, and perhaps laid him on a pillow of hay. The story of the Christ child’s birth is profound and beautiful not from all the trappings and bows, but from the lack of it. The scene full of such abject poverty radiates the light of the Son of God. Young children find the joy and wonder of this simple, yet profound, scene. Never did the Savior give in expectation of receiving. He gave freely and lovingly, and His gifts were of inestimable value. He gave eyes to the blind, ears to the deaf, and legs to the lame; cleanliness to the unclean, wholeness to the infirm, and breath to the lifeless. His gifts were opportunity to the downtrodden, freedom to the oppressed, forgiveness to the repentant, hope to the despairing, and light in the darkness. He gave us His love, His service, and His life. And most important, He gave us and all mortals resurrection, salvation, and eternal life. We should strive to give as He gave. To give of oneself is a holy gift. We give as a remembrance of all the Savior has given. Christmas is a celebration, and there is no celebration that compares with the realization of its true meaning—with the sudden stirring of the heart that has extended itself unselfishly in the things that matter most. The things that matter most are the gifts of oneself. Freely forgiving another. Showing compassion and love to those in need. Extending a hand of friendship to someone who is struggling. These are the greatest gifts because they are the gifts of Christ. … Children invite the magic of Christmas into our hearts. We miss something if we don’t see Christmas through a child’s eyes, for children see the lights, they hear the music, and they smell the fragrance of Christmas trees and candy canes with real anticipation. We see their rosy cheeks and little noses pressed against the glass of store windows as they dream of Christmas morning, and their tiny fingers count the days until December 25. Parents also count the days until December 25. They dream of being ready for Christmas morning as they plan and create surprises for their children. The wonder and awe of Christmas is just a beginning. Christmas reminds us that the babe born in Bethlehem has given us purpose for living, and what happens next to us largely depends on how we embrace our Savior, Jesus Christ, and follow Him. Every day we invite His Spirit into our lives. We see light in others; we hear the joy of children’s voices that bring hope and anticipation for the future. We look for reasons to gather, to include, to serve, and to lift, while we learn what it really means to know our Savior, Jesus Christ. We find ourselves counting the days until the events in our lives when we more intently feel His influence—for example, the birth of a baby, a child’s baptism, a missionary departing, a marriage solemnized in the temple, and partaking of the sacrament each week. Through Christlike and childlike faith we seek Him and we feel His influence. When we see through the eyes of a child, we can see the wonder and magic in the Christmas season. And if we continue to humble ourselves, we can keep the spirit of Christmas—which is the spirit of Christ—with us throughout the year and through the years.